The latest "Real Driving Simulator" lets you really simulate driving on the moon. 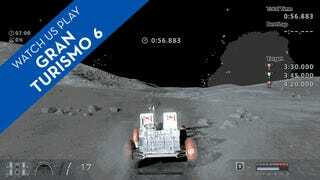 So here's how to unlock the "Lunar Roving Vehicle LEV-001 '71" in Gran Turismo 6, as well as a glimpse into the dangers of life on the Moon. If you want to unlock the lunar rover and do some sweet moon jumps, but can't be bothered to click the video, I'll tell you the secret here. You need to play for an hour or two until you unlock national license A, and you'll be greeted with a message that you've unlocked lunar missions, as well as Online Mode. If you're just interested in the latest Gran Turismo for this, I've got bad news for you. The lunar rover missions only add up to about 10 minutes of gameplay. Then again, where else are you going to have a super-accurate moon driving experience?